Shay Logan in action for Aberdeen against Hamilton Accies last night. Logan has been spoken to internally by the Dons about the Snapchat posting, in which the defender was recorded swearing about the Ibrox club by one his friends and put online. Aberdeen manager McInnes feels Logan has been guilty of trusting too many people within his own friendship circle and will speak to the player individually today. McInnes said: “The club has spoken to Shay about his version of events. My take is his pal has let him down. It was a private conversation, with the two of them having a bit of a laugh. It reinforces the message to all of my players that you have to be so careful of what you’re saying and who you’re saying it to. Logan is unlikely to be punished by the Scottish FA for the incident, which came after the Dons had beaten the Gers 1-0 in the Betfred Cup semi-final. It is not the first time Logan has made headlines this season, after making allegations that Celtic fans had racially abused him at the end of the last campaign. He has already served a suspension this season after being hit with a retrospective ban following the Parkhead clash, in which Logan was sent off after the final whistle for altercations with a number of Celtic players. The ex-Manchester City and Brentford full-back played in the 3-0 win over Hamilton Accies last night, with Mikey Devlin, James Wilson and Graeme Shinnie finding the net. 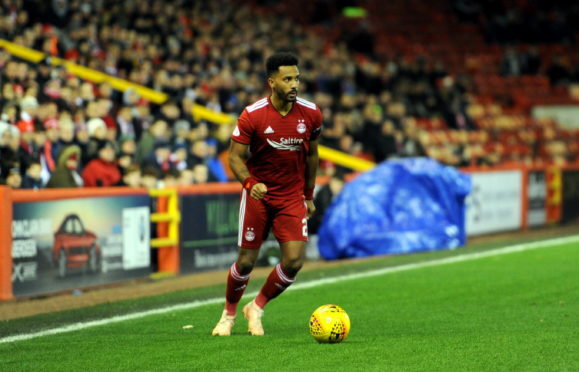 McInnes was pleased with the performance of Wilson, who notched his second goal for the club with a 30-yard wonder-strike.